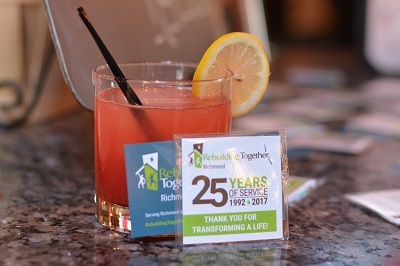 RICHMOND, Va — Our Eat, Drink, Rebuild Happy Hour at Social 52 Kitchen & Craft Bar was a great success with over 40 Rebuilding Together Richmond (RTR) supporters and volunteers showing up to network and socialize. “I would rather help those in the community who need it, than go on a vacation,” Kyle Martin, of Saint James Episcopal Church, said. Martin has been involved with RTR for over 10 years and is thrilled to see the continuous growth over the years. He believes it is important for volunteers to stay engaged with our organization. We would like to thank everyone for their continued support. This happy hour was hosted to help fund our upcoming 26th Annual National Rebuilding Day (NRD) on April 28th. NRD is the day members, sponsors and volunteers team up to help repair homes in the Brookland Park area of Richmond. We are currently planning to fix up 35 homes. If you missed this happy hour or would like to stop by at another social, we will be hosting the Kickoff to Rebuilding Day Happy Hour on April 24th from 4-7pm at Lalo’s Cocina at 2617 West Broad Street, Richmond, Virginia.